Discover the miraculous with this investigative documentary film by Darren Wilson. Following on from the success of Finger of God and Furious Love this DVD documents spiritual encounters from around the world with integrity and truth. Want to discover the world of Spiritual power? Third in Darren Wilson’s trilogy of searching documentary films, ‘Father of Lights’ gives you an insight into the world of the global spirituality of the gospels and its tangible expression in the reality of the miraculous. In the style of film makers such as Michael Moore, Wilson searches out examples of self-sacrifice, supernatural guidance, remarkable 'coincidences' of faith, and living examples the power of love as an expression of God's heart for his children. This is region 0 (multi-region) DVD and will play on all DVD players. Subtitles: English, French, German, Japanese, Koren, Polish, Portugese, Spanish, Simplified Chinese, Traditional Chinese. 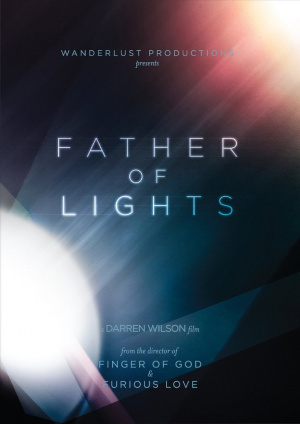 Father of Lights DVD by Darren Wilson was published by Authentic in October 2015 and is our 2573rd best seller. The ISBN for Father of Lights DVD is 5060424955671. This documentary is a really inspiring watch. Very moving and a real eye opener. It takes you through some incredible stories which will leaving you feeling on fire for God. Can't wait for another film by Darren Wilson. Got a question? No problem! Just click here to ask us about Father of Lights DVD. What is the running time of this DVD please? A:The running time of this DVD is 98mins. A:This DVD is produced in 'multi-region' format, and will play on all standard machines worldwide. 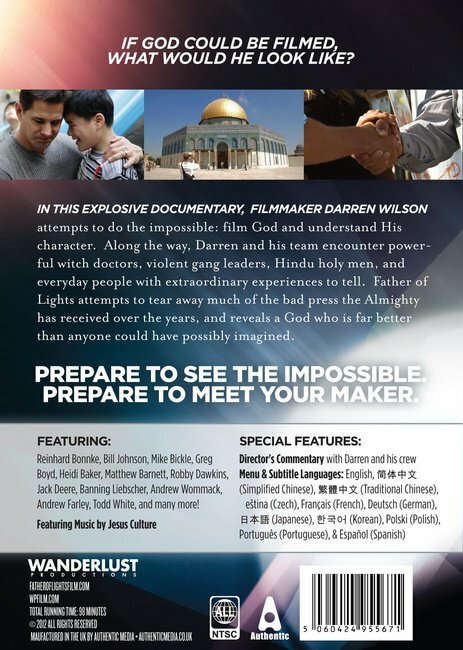 PUBLISHER'S DESCRIPTION: Through filming incredible and often historic, spiritual encounters around the world, Darren Wilson cuts through religious misconceptions in an effort to find the true nature and character of God. In this final installment of Darren Wilson's popular "God Trilogy" ('Finger Of God' and 'Furious Love'), Darren and his team take you on their wildest, most powerful ride yet. Asking the simple question, "Who is the Father?" you will be blown away by the incredible and historic encounters they were able to capture. Featuring a veritable 'who's who' of Christian leaders from around the globe, and witch doctors, gang leaders, Hindu Gurus and Muslims alike encountering the God of the Bible, you will never view the Father quite the same again. Prepare to meet your Maker, as Darren and his team expose the heart of God. Woman: “He doesn’t expect you to come all clean and all shiny and all perfect. He expects you to come to him the way you are before you know him – as an orphan. “I managed to get a preview of the film and was simply bowled over by the love and grace of the evangelists that were filmed. These were people who truly demonstrated Jesus as he would have been on earth and revealed the abundant love of our Father in heaven. My 13-year-old son joined me and was also fascinated by it. This film will be a key milestone in transforming the church and our approach to the lost and hurting around us.” – Kingdom Vision. Darren Wilson carries the title of ‘Adjunct Professor and Filmmaker’ at Judson University, Elgin Illinois. For 2012 he announced a full summer tour for his latest Wanderlust Productions film, "Father of Lights," - the third installment in his epic documentary series exploring God's power and love across the world. Wilson himself earned his Bachelor of Arts degree from Judson in 1998 along with a major in English and minor in Biblical Studies. For more than 12 years he has taught media and writing at Judson in the same department from which he graduated. Wilson turned his career to the practice of filmmaking in 2005, and produced his first documentary "Finger of God," in 2007. In 2010 he followed it with its sequel, "Furious Love". The two films have, to date, combined to sell over 120,000 DVD copies. Of his latest film, Wilson says that it is “…big, epic, and above all, challenging. If I were to have to explain what it is about in a nutshell, I would put it like this: if Finger of God is about God’s power, and Furious Love is about God’s love, then Father of Lights is about God’s heart. I went into making this film by asking the simple question: who is God? I wanted to know His character, His personality, and who He truly is. To answer this question, we had to peel back the many layers of religious garbage that has been passed onto him through generations. That He is angry. Vengeful. Wrathful. And in general, that He doesn’t like you very much. The truth, as you will see vibrantly in this film, is that He is the most loving, compassionate, and wonderful Father you can imagine. For the final installment in this documentary series about God, Wilson says he went into the film with a simple question: Who is God? “Along the way we will look at a number of things. Aside from dealing with some of the misconceptions surrounding the Father, we’ll journey through the nature of grace, take on the religious spirit, and see some of the most amazing God encounters ever put on film. You’ll meet people who love more extravagantly than you thought possible, will watch God deal with witch doctors and gang leaders and Hindu holy men, and you’ll see an ending that… well… let’s just say you’ll need to see it to truly believe it. For the release of this final film in his groundbreaking series, Wilson's production company sought an extensive tour showing the film in 30-40 large venues/churches during the summer of 2012. To fund the tour, they began a kickstarter.com campaign with a goal of $15,000. Within less than 24 hours of opening the campaign, their goal had been reached. By April 30 when the campaign closed, they had raised $95,733. In 2013 Wilson will be leading a unique co-op program that will give students hands on film-making experiences through his studio, Wanderlust Productions, which is housed on Judson's Elgin campus. Darren Wilson (Narrator), Robby Dawkins (minister), Todd White, Deena Vant Hul, Doug Addison (Tattoo Prophet), Heidi Baker (minister), Matthew Barnett, Mike Bickle (Pastor), Shawn Bolz (minister), Reinhard Bonnke, (minister), Randy Clark (minister), Jack Deere (minister), Majed el Shafie (minister), Andrew Farley (minister), Shanti Ice (minister).